Easy Gluten Free Macaroni and Cheese - Ready in minutes! Gluten free mac and cheese at its easy best. This recipe only takes about 20 minutes to make from start to finish, and it’s made entirely on the stovetop. So good! This super easy gluten free mac and cheese is just the recipe you need. I know this because I use it regularly for a last-minute dinner in my house when I basically have nothing planned and everyone is hungry hungry hungry. It’s made entirely on the stovetop, uses only basic gluten free pantry ingredients (yes, you really do need a basic gum-free gluten free flour blend but it’s only 3 simple flours and incredibly useful), has no eggs and is ready in minutes. So not only is it perfect for a weeknight (or a Friday night when you’re just.plain.tired), it’s also perfect for the holiday table since, well, it doesn’t use the oven! It’s creamy and dreamy and delicious. And you can even make the pasta hours and hours ahead of time, then just cover it and keep it at room temperature until you’re ready to throw together the cheese sauce and serve. It’s that easy! Okay so I did the step-by-steps and the video above because you can see for yourself how easy it is. All you do is make a roux out of butter and the simple flour blend, then add the milks and the cheese with a bit of seasoning, and mix in the cooked pasta. There are ways to make this even easier by tweaking the method to cook the dried pasta in the same saucepan first, but you have to use more liquids and the overall method isn’t any easier. In fact, I think it’s more complicated and confusing. The good news is that you can even boil the pasta ahead of time, toss it with some olive oil, then cover it and keep it at room temperature for hours (or even a day, when the weather isn’t steamy). Then, make the cheese sauce, add the pasta and dinner is served. So creamy! I’ve even made the pasta at home, then brought the handful of cheese sauce ingredients and a medium-size pot, and made this at my brother’s house to serve a great gluten free meal away from home with ease. All you need is a simple veggie side dish, like this Shaved Brussels Sprouts Salad from Fearless Dining, and dinner is served. What if you’re dairy free, too? I would never have thought that I could tell you that there was even a prayer of taking my recipe for gluten free mac and cheese and making it dairy free. But ever since I made Paleo pizza with vegan cheese that actually melts, I think it’s worth a shot. To be perfectly clear, I have never tried to make this mac and cheese recipe (or any, really) myself dairy free. But I think it’s worth your while to try replacing the butter with Earth Balance buttery sticks, the milk with unsweetened almond milk, and the cheese with my favorite recipe for meltable vegan mozzarella by Miyoko Schinner. Casserole-style GF Classic Mac and Cheese. Slow Cooker GF Mac and Cheese. *Make ahead option: You can place the cooked pasta in a large bowl, cover it with plastic wrap and leave it out at room temperature for up to 8 hours before proceeding with the recipe. To make the cheese sauce, melt the chopped butter in a medium-sized, heavy-bottom saucepan over medium heat. Add the flour blend and stir to combine well. The mixture will clump at first, and then smooth. This is the roux that will thicken the cheese sauce. Cook over medium heat, stirring constantly, until the mixture has just begun to turn a very light brown color (about 2 minutes). Add the evaporated milk to the roux very slowly, stirring constantly to break up any lumps that might form. Add 2 cups of milk, and whisk to combine well. Bring the mixture to a simmer and continue to cook, stirring occasionally, until thickened and reduced by about one-quarter (about 7 minutes). The sauce should coat the back of a spoon. Remove the saucepan from the heat, add the grated cheese and mix to combine with a silicone spatula or wooden spoon. Add salt and pepper to taste, and the remaining milk a bit at a time if you like a thinner cheese sauce. Pour the hot cheese sauce over the cooked pasta, and stir carefully to coat all of the pasta in the cheese sauce without breaking up the pasta at all. Serve immediately. Originally published on the blog in 2014. Video and some photos are new, the recipe is unchanged. Hi I always make dairy free mac and cheese, have been for years actually. Is there a pasta brand you recommend for this dish? Yes yes yes! These days, I rarely use anything other than Barilla gluten free pasta. It’s the best I’ve tried, and I’ve tried many. I tried making the gf Hawaiian bread rolls and failed horribly. but i’m determined to make this work. is the a gf pasta that will work well in cold salads? I really like the Barilla pasta that Nicole mentions, and have used it for cold salads, but after 24-48 hours in the fridge, the GF pasta gets dry and almost brittle. It soaks up a lot of whatever sauce you are using and the texture becomes unpleasant. We make a cold Greek pasta salad with Barilla Penne noodles that is awesome for the first day. We try to eat it within 2 days because after that it’s definitely sub par. I try not to refrigerate cooked pasta, Brenda. If it’s just plain cooked pasta, tossed with butter or oil, we put in a sealed container and leave it on the counter. It’s good for at least a day. I have been out of power here for over 48 hours, I could have used this recipe! Oh no, Lucy! I hope you’re back in business really fast!! Yes we are back online, just in time too, temp at -12 C = 10.4 F.
Burrrr it’s cold! With the wind it feels more like -20 C = -4 F.
I tried this today. Everything went well, but the cheese has a bitter flavor to it. Do you have any advice on how to combat that so I don’t waste the whole pot of mac and cheese? Noni, I’m afraid I don’t know why your cheese would taste bitter. Perhaps it was spoiled? This is such a simple recipe that the taste of the cheese will really shine through. Noni–I tried making this tonight and I burned the bottom of the roux, so it caused a bitter taste. I turned up the heat to get the roux/milk mixture to come to a simmer quicker and all of a sudden I noticed a burnt smell. I tasted the sauce and it was bitter. Do you think that might have happened to you, too? Oh my goodness!! Those pictures are making me salivate & I just had my 4th helpings of Thanksgiving dinner!! Consider this pinned, & when I have more room in my stomach, know that I will be making this because I’m a sucker for Mac & Cheese! Stomach space is at a premium this time of year, indeed, GraceFaith!! I made this today and my very picky, only from the box, Mac n cheese eater, actually ate it! I also made your mashed potatoes (had to sub Greek yogurt for the sour cream), your gravy (subbed buttermilk for the evaporated milk), your green bean casserole, and your stuffing (used your cornbread recipe for the bread) — all delicious! Other than planning better for my grocery shopping (only bought one can of evaporated milk), I think it went pretty well. We ordered a smoked turkey from a local barbecue restaurant, so I didn’t have to worry about the turkey. Thank you so much for all of your wonderful recipes! That all sounds perfect, KLarimore! I think your Thanksgiving table looked a whole lot like mine. Except for that smoked turkey—I’d have loved some of that!! I may need to see if I have time to squeeze this one in today since it doesn’t require the oven! 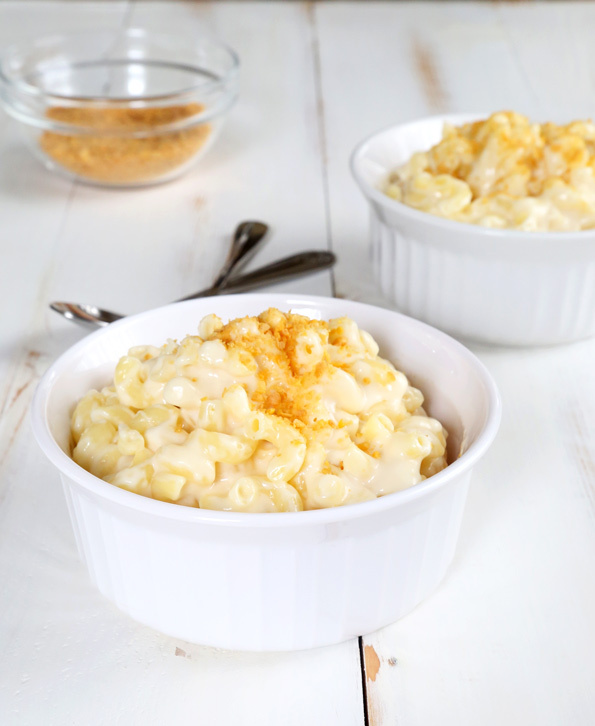 My husband and son love mac and cheese to be creamy–this looks perfect! I’m baking your apple pie in a bag (I made and froze it a week ago) and your green bean casserole today. Happy Thanksgiving!! I hope you had a very Happy Thanksgiving, kitty!! I’m not a cook.. can you just use Gluten free flour, or does it have to be a blend??? You must use the flours as specified, Hal. No one single GF flour will work. We have used GF Barisal pasta also but I have found Walmart brand GF elbows quite good too! I’m totally convinced she does have super powers… besides cooking and baking, I mean. Thank you. Hand modeling is no easy task. But at least you get to eat the props. What is the topping that is sprinkled on? Grated cheese? Or bread crumbs? Looks like crumbled cheese crackers to me (which sound good!) We will await her answer! My family would love this recipe! some sort of powdered cheese maybe? Hi, Kathleen! Actually, it’s just ground cornflakes. I always have a whole container of those because I use them so often!